I am tempted to write about last week’s conference on ‘Strategy and Sustainability’ – I have heard from many people that it was valuable and some have even said it was the best gathering ever. But a blog is not a newsletter, so I will include the updates on our website. I also want to write about the value of accreditation – our third review of the year started this afternoon, and I have enjoyed reading the email exchanges between the Visiting Committee members before and after the visits. But rather than blog about them, I am going to include those in the November newsletter. 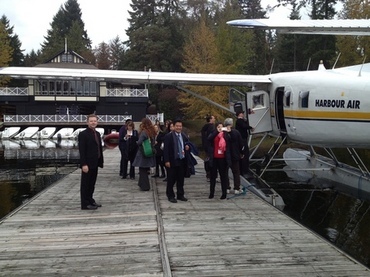 I really want to describe the tour with the ten agents in 18 of our boarding schools – they said things like, “I used to send students to the UK but now I will encourage them to choose Canada first” and “I had no idea that CAIS schools were so amazing.” I had a great time with them, especially when we got to fly in a float plane from Vancouver to Shawnigan Lake, and I mean we landed on the dock of Shawnigan. But I will include a photo and link to social media for those updates. Why not write about three great happenings with CAIS? Because Sarah Milligan often reminds me that a blog is not a newsletter. It is supposed to be a personal online diary, and she doesn’t want me to bore anyone with CAIS updates. Communications should be appropriate to the medium. Two weeks ago, right before the conference, agent tour and reviews, Kevin and I went on a four-day road trip with two other couples. That’s six adults in one car for ten hours each way. I was reminded that I should take time to do something crazy… even when life is busy – maybe especially when life is busy. We went to Charlottesville Virginia. 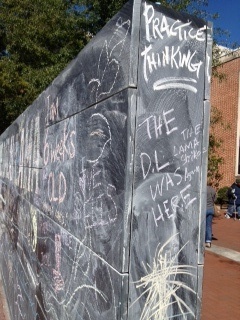 In the downtown area is an outdoor mall with a chalkboard wall with two words at the top: Practice thinking. I loved it. Then we went off to Blenheim, the winery that Dave Matthews started. Not only is he an amazing musician – we blasted his music for most of the trip – but he is creative. My favorite lines from ‘You and Me’ are still in my head: ‘When the kids are old enough, we’re gonna to teach them to fly.’ Sometimes we need to go on a search for what is beautiful. Our friend Lisa, who inspired our little trip, is about to go through another round of chemo. Her cancer has spread to her lungs and liver, and yet she is the most positive person I have ever met. We talked and laughed – and sang – all weekend.